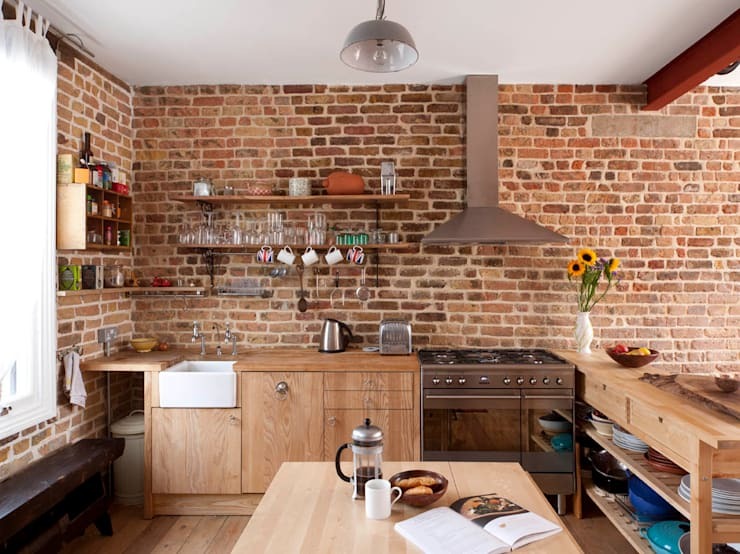 A kitchen in rustic style, with lots of wood work and brick walls is always a delight to work in. 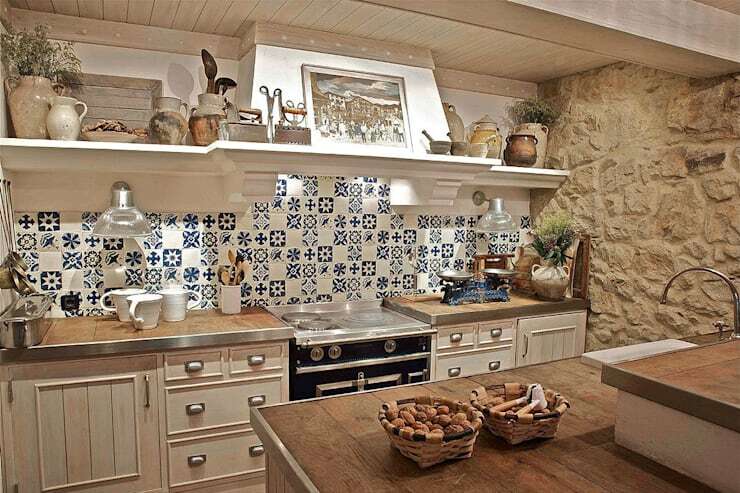 A rustic kitchen makes you feel having traveled back in time to the aroma of the food the grandmother used to cook . In modern houses, even a combination of country and modern styles can make your kitchen more personal and very functional. 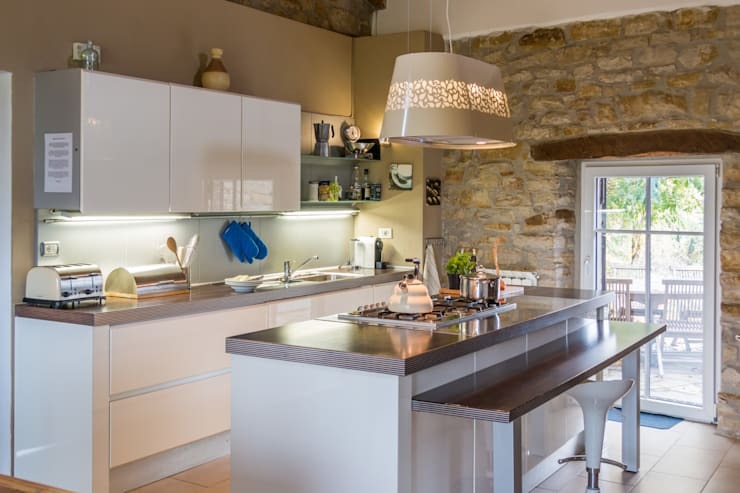 Hanging lights from the wooden beams from the skylight design, makes this country style kitchen bright and funky. 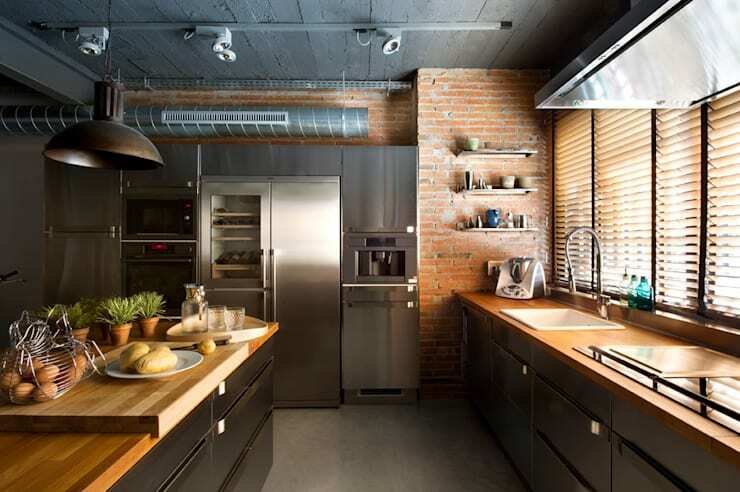 Brick walls coupled with blue cabinets is the combination you would love forever. 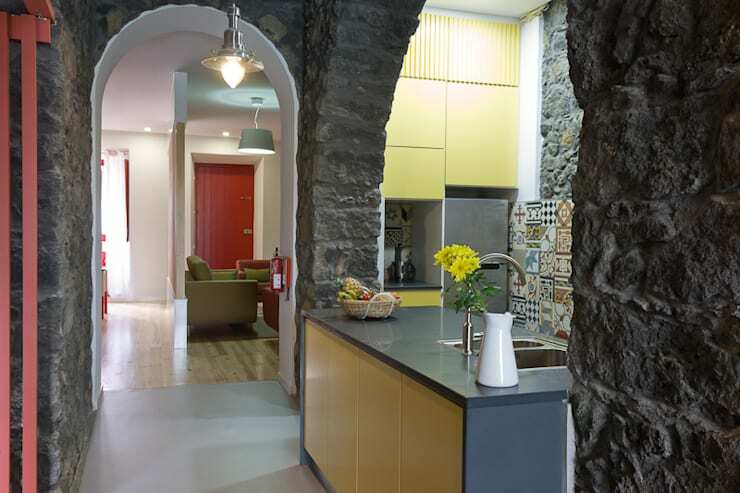 There is so much texture in this kitchen, owing to the uneven stone walls. The wall stands out against the white kitchen and gives its a unique rustic flavor. 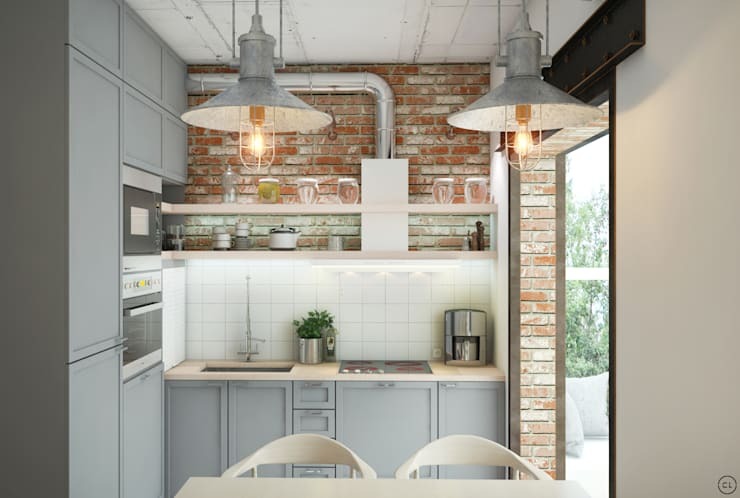 This kitchen creates an industrial look, with the mottled brick, the straight forward cabinets, and the big hanging lights. 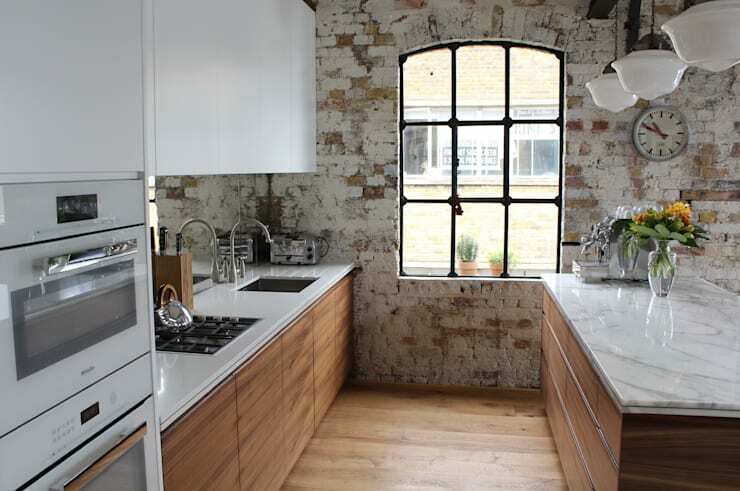 The pipe is deliberately not concealed to add on to the industrial look of the kitchen. Black kitchen cabinets against an imitation stone wall adds a bold personality to this rustic kitchen. Wooden cabinets coupled with stone counter-top, standing against an industrial brick wall add a certain sense of glamour to this elegant looking country style kitchen. 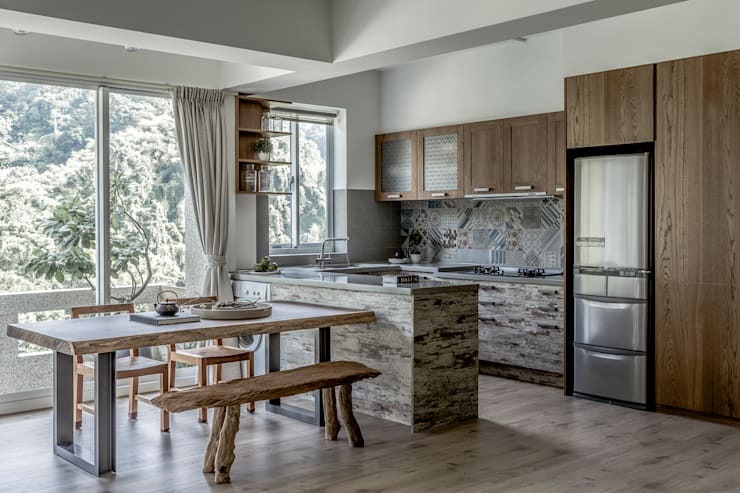 Taiwanese experts created this country style kitchen with the concept of home Zen. The simple wooden furniture and wooden cabinets and the large window add to the mountain country feel in this beautiful rustic kitchen. 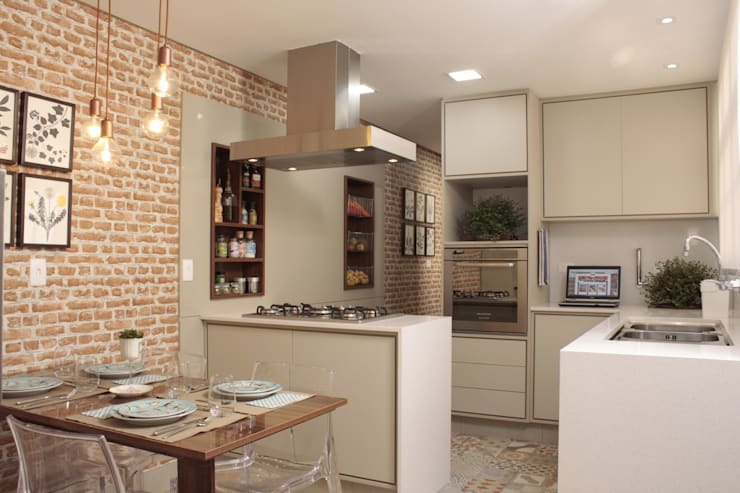 Large brick walls and wooden cabinets in a very similar color, coupled with the wood shelves looks very trendy and gives an authentic village kitchen vibe. 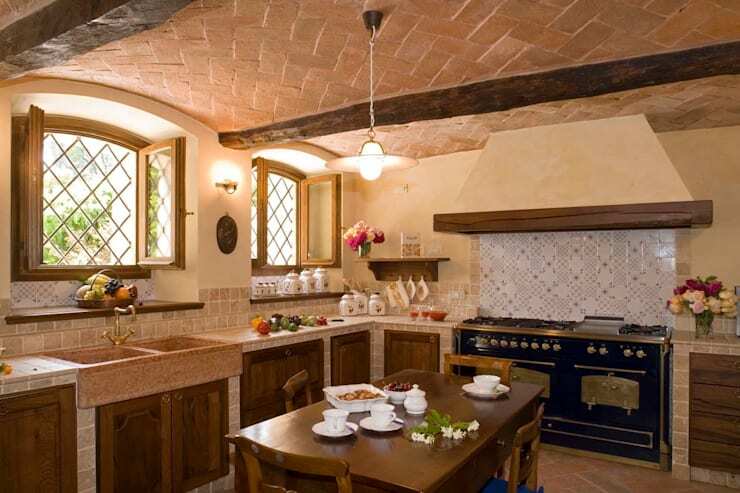 The copper chimney and cooking range adds to the rustic charm. Impressed? 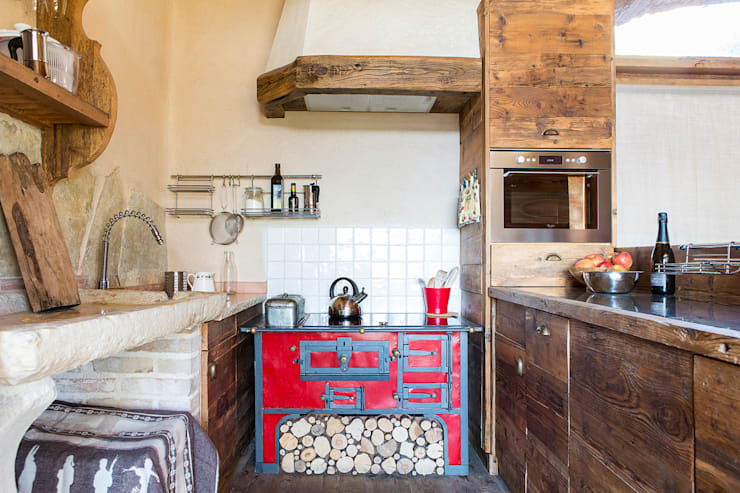 See 7 ravishing rustic kitchens you will relish. 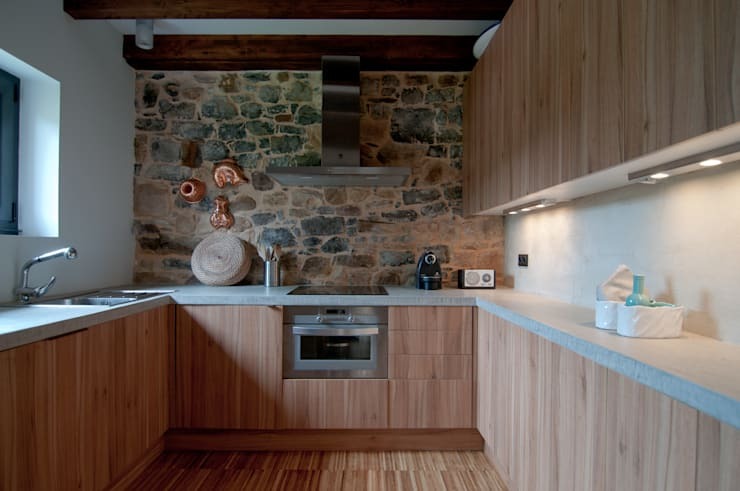 With different colors and shapes of stones together, this small kitchen looks beautiful in all stone and wood. 9. 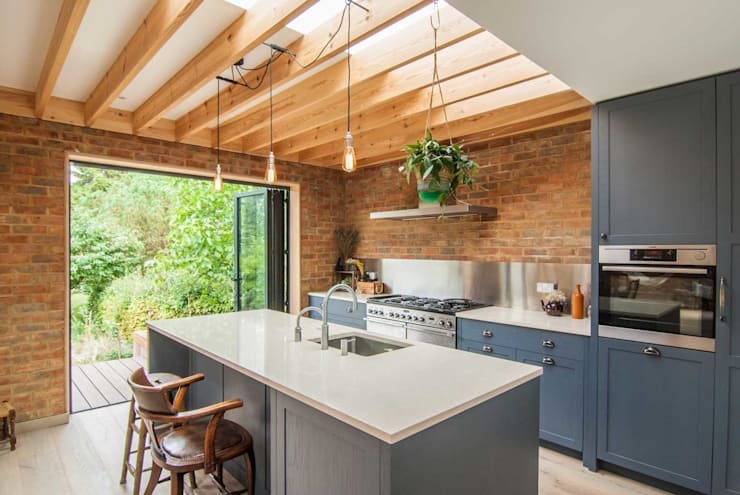 White tiles create an illusion of space, and give a chic look to this kitchen, which has brick walls on the opposite side to give it two complementing but different personalities. Here are 6 hacks for a ravishing retro kitchen. A natural stone arch right above the counter top adds to the country feel to this kitchen, which sits in a completely modern home. 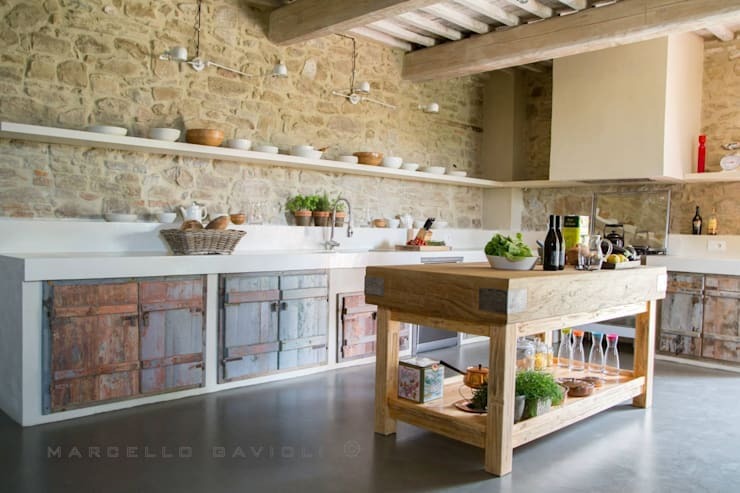 This kitchen boasts of a handmade wooden table, in unfinished paint look, under the wooden beams. A perfectly rustic ambiance! Here are 11 kitchen ideas you can easily copy. This unique kitchen is made with antique wood in very natural texture, and the bright vintage furniture adds a beautiful dimension to the small country kitchen. 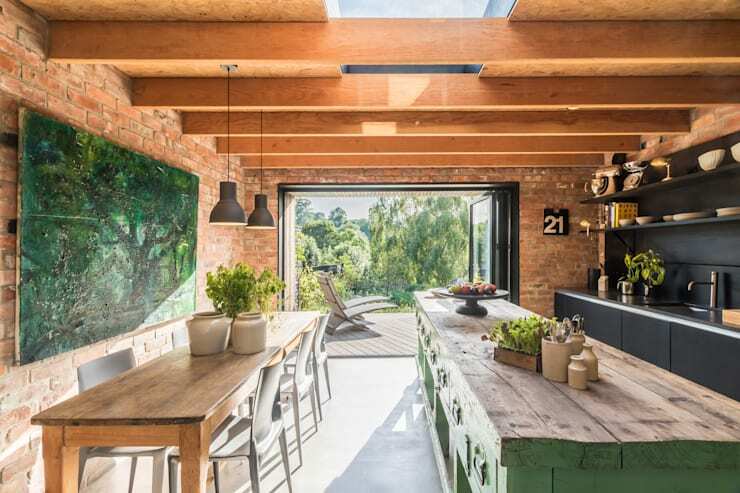 Bricks and wood are established rustic elements, combining them with appliances brings a sense of industry to this lovely looking country kitchen. 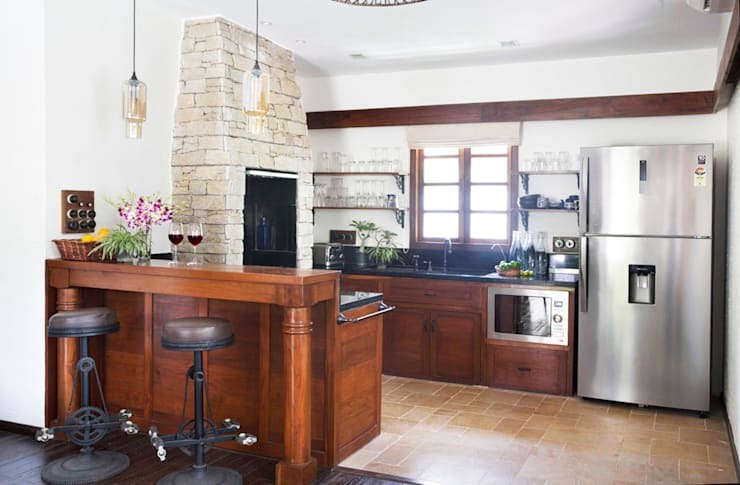 Dark wood table and cabinets against the light stone wall add a beautiful contrast to this kitchen. The bar stools and the hanging lights make it a perfect evening hangout in the home. 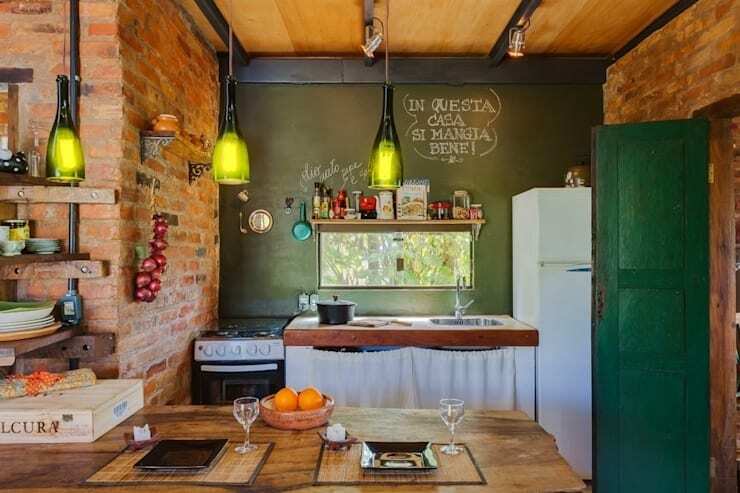 This small kitchen with a green chalkboard wall along the brick walls is statement in itself. 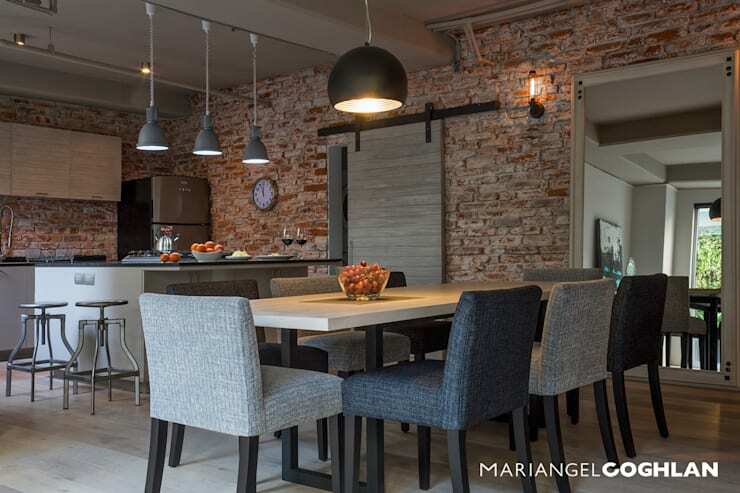 The hanging bottle lights, the onions on walls create a cozy and informal rustic atmosphere. Here are 7 thrifty ways to redecorate your kitchen. Tiled wall creates a highlight against the light textured stone wall and the white shelf over the counter adds a unique style to this country kitchen. 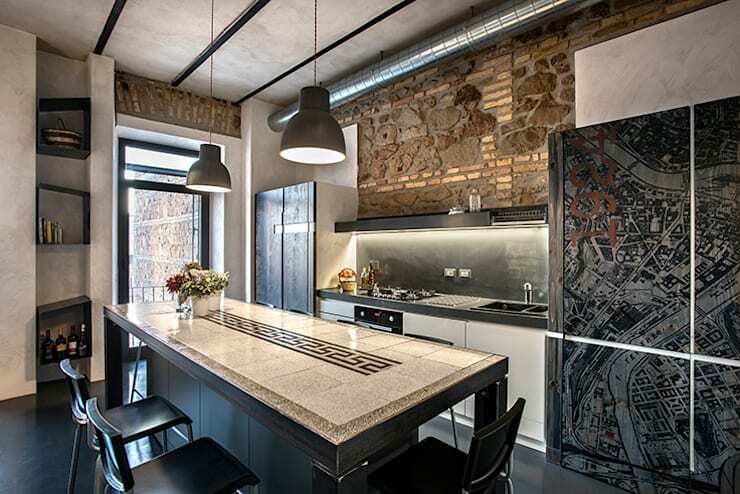 The elements used in this unique kitchen are the same, the stone, the hanging lights, but the material used is absolutely modern and chic. This country style kitchen has the most amazing looking antique cabinet doors and the cute wooden table in the center. Rustic in its full splendor. Here are 10 ideas for a super organized kitchen. 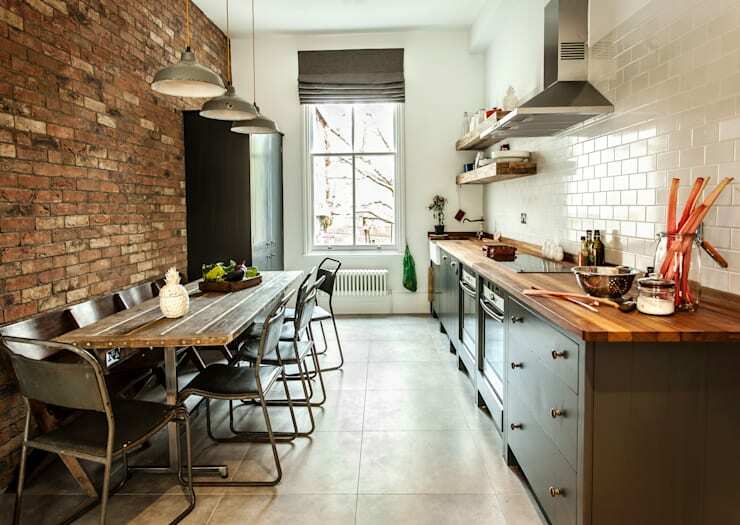 This kitchen has an elegant industrial yet rustic feel to it owing to the brick walls and grey decor. Kitchen has become a go to place with such thoughtful ideas. The traditional details and design, let this kitchen live off is the most typical country style kitchen. One can never go wrong with wood and white. Coupled with the white furniture and the focus lights, this kitchen looks very cozy and bright. 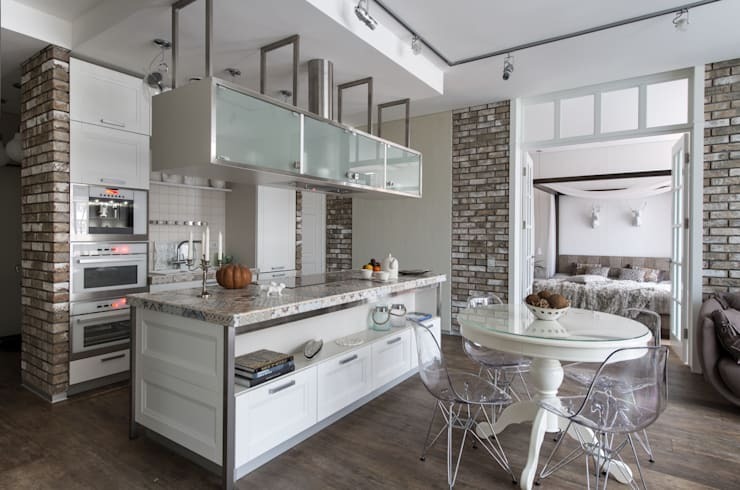 When you want to get a quick fix rustic kitchen, get a wallpaper in brick design, couple it up with wooden fixtures, or tables and you are set with a rustic kitchen in a jiffy. Here are 10 cheap kitchen decor hacks. 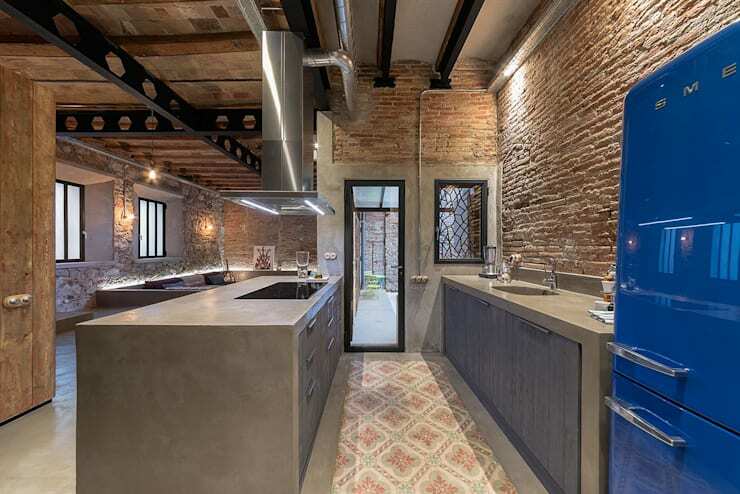 The patterned floor tiles, as well as the concrete cabinets stand out against the brick background, are the highlight of this country kitchen. Who will not fall in love with this kitchen, they say Red is the color of love. 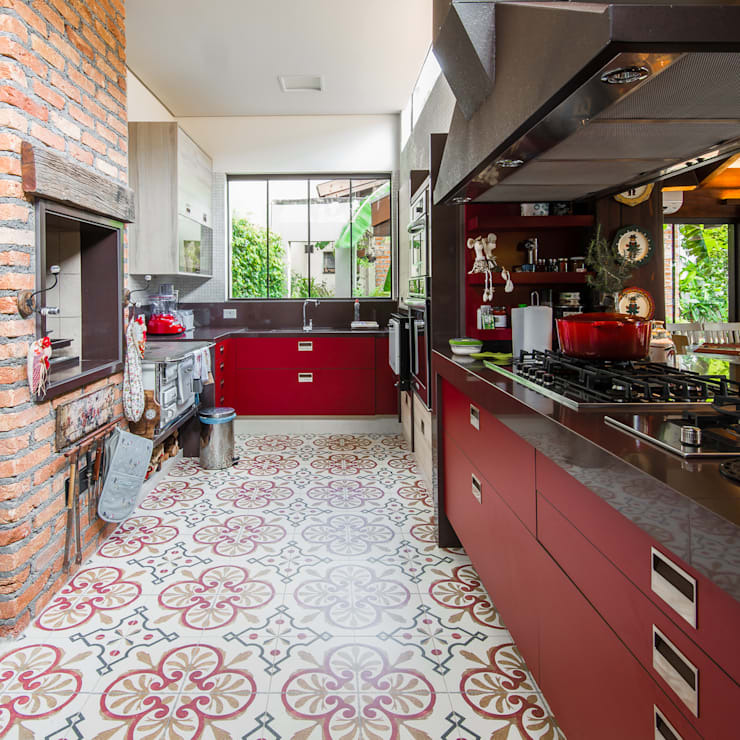 Beautifully complimenting the brick wall, and the patterned floor, the color red is the protagonist in this kitchen and makes it look bright and stunning. 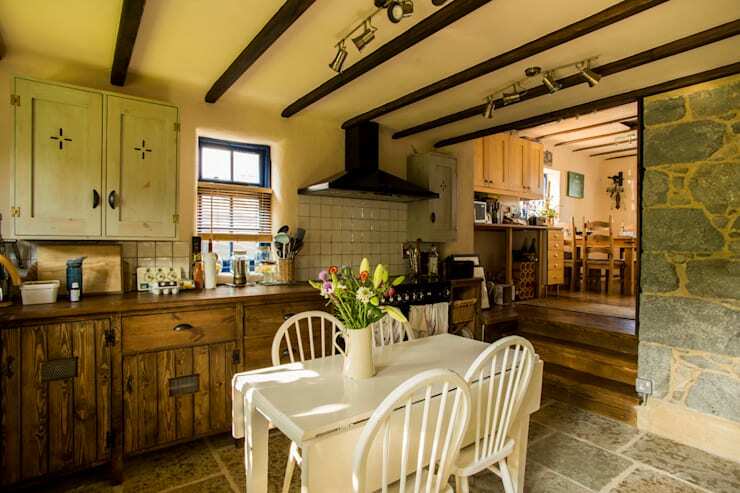 Already feeling inspired to get your own country kitchen? Let us know what is the best thing you like about the country kitchens.